IMAGINE savouring all those mouth-watering sweet temptations but this time, minus the guilt. 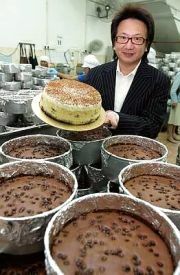 Steven Sim, the CEO and MD of Secret Recipe Cakes & Cafe Sdn Bhd, which operates one of Malaysia’s fastest growing cafe chain, is preparing to launch cakes-without-guilt in the third quarter of this year. The low-calorie and low fat selection are currently being developed as part of the chain’s annual RM2mil research and development programme. “Obviously, it will mean carefully picking ingredients without compromising on taste. This selection will be more expensive as we will be using a lot of imported ingredients,” says the 46-year-old Sim. Sim and his team have been researching the selection for the past six months. “We develop our products by listening to our customers. We do not sell for the sake of selling,” says Sim, who goes through customers’ suggestions and complaints daily. When he first started the chain in 1997, he had a selection of 12 to 25 cakes. Five years ago in 2001, when he went into fusion meals, he had only four on the menu. Today, he has a variety of 50 cakes and 60 fusion meals and drinks. The chain develops new products annually to stay ahead. “It is challenging when you are at the top. You have to ensure you remain there, or to at least grow some distance away from your competitors,” he says, adding that the concept of medium-price range cafes is only five to six years old and has become a trend among urbanites. “When the economy goes down, people will patronise the exotic restaurants less... less shark fin. But RM15 to RM18 for a meal per person is manageable for many, even in a slow economy,” says Sim. Secret Recipe started in 1997, just before the Asian financial crisis; having weathered SARS (severe acute respiratory syndrome), bird flu and Iraq war. “I don’t see anything worst than these,” says Sim. The company’s annual turnover growth for the last three years has been around 30%, with sales of about RM70mil for financial year 2005. The former marketer for hair care products will invest RM5mil to RM6mil in a central kitchen in West Port to meet the demands of the current 120 outlets, the number of which is still growing. That figure includes land cost and building. The company will be moving to the 2-acre site in the Selangor Halal Hub in about 18 months. It is currently renting its central kitchen premises in Petaling Jaya. Sim will be opening four new restaurants over the next six months in smaller towns. But Sim also knows the weaknesses that come with extensive and expansive growth. “The more outlets we open, the more we are challenged by this threat of bad service. Ninety per cent of the complaints relate to our service. “I am very frustrated about this. In Indonesia, because of unemployment, the Indonesians go all-out to serve. Thailand has a culture of serving. 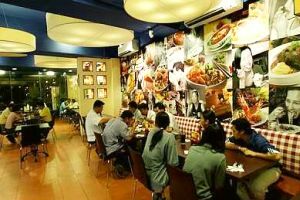 (There are six restaurants each in Jakarta and Bangkok.) Over here, the norm is – take it or leave it! “I want to spend money in this area. I want to benchmark myself with Australian and US restaurants. How they seat the guests, how they introduce the menu. Maybe our customers are not tipping but that does not mean our service should be inefficient or not go the extra mile,” he laments. About two weeks ago, the company signed three international franchise agreements. Sim also plans to go to the Philippines, India, New Zealand and East Malaysia by the end of this year and move on to Saudi Arabia, Dubai, and China by next year. Sim says its overseas expansion is a key part of the company’s overall growth strategy and franchising will speed up this process. On the popularity of its franchise programmes abroad, Sim says cakes, which are the company’s strength (not pastries), is pretty universal. Sim plans to set up 15 cafes in New Zealand and India within three years and six in Kota Kinabalu within the same period.